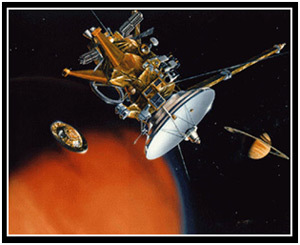 There’s been a lot of hoopla in the news lately about NASA’s probe, Cassini-Huygens, and its visit to Saturn. I grew up reading science fiction novels and I’m fascinated that in our current exploration of Mars and Saturn we could be on the verge of discovering life (albeit of the single-celled variety) on other planets and moons in our solar system. If a discovery like that is verified, I can only hope that the public consciousness will then latch onto what might be out in the near infinity beyond. Despite working in a department that actually rebroadcasts the NASA channel; I regrettably have very little time to pursue all the latest news of their findings. Still, the bits and pieces that I catch online and on the news are intriguing; what’s more, they sparked a memory I had of doing some research on the Cassini probe back in 1997 while I was still in college. This is where being an amateur archivist pays off. I was able to dig up an old CD-ROM backup of the screamin’ 90Mhz Pentium (with 16MB of RAM, and an impossible-to-fill 730MB hard drive, baby!) I had throughout my college career. Written for Freshman Comp. (taken in, yes, my senior year), this is an unexciting, compare-and-contrast, research paper, but I thought I’d post it here for nostalgic purposes and for a look back at the NASA hoopla of seven years ago. January 28, 1986 dawned cold and clear on the Kennedy Space Center in Florida. It was the 25th mission for the space shuttle program and the 10th mission for the Space Shuttle Challenger. The American public had lost much of its interest in the space program. This mission made us all a little curious by sending the first person not trained as an astronaut, a civilian grade-school teacher, into space. (Gagnon). Thousands watched from the designated areas around the Kennedy Space Center and millions more from their television sets as the Challenger left the launch pad at 11:38am. Seventy-three seconds into flight the vessel exploded sending the still-firing booster rockets in an erratic path and fragments of the shuttle Earthward. For the next few moments, America sat stunned while they listened to their radios and television sets as the events were replayed and the seven crew members were presumed, then pronounced, dead. (2). Many people joined a coalition to stop the Cassini mission because they were adamantly against the use of any radioactive material in an earth-launched, space-bound vehicle. Instead of wasting time and resources trying to ban such programs, they should have been attempting to encourage NASA in their attempts to develop and enforce ever stronger safety procedures. Indeed, the critics have a valid concern. There have been many cases throughout the history of the space program where catastrophe has struck. In fact, one was a Titan IV launch, one of only twenty, which destroyed the rocket and its payload in a fiery explosion over the Pacific Ocean in 1993. Another, more recent, accident involved the possible release of plutonium. Late last year, citizens of Australia were told to prepare themselves for the possible crash of a failing Russian satellite. Luckily the spacecraft missed Australia completely and fell “harmlessly” into the Pacific Ocean, off the coast of Chile. It was reported that no plutonium had leaked, but critics believe that the search was not conclusive. The plutonium may have been turned to dust by the satellite’s reentry into the atmosphere, or it may be resting on the bottom of the ocean waiting for nature to wear away its casing. All told, at least 3 of the known 24 U.S. missions involving nuclear power and at least 6 Russian missions have met with disaster. These incidents prove that accidents do happen, and that the results are very serious indeed. (Hewitt, 6). NASA, though, maintains its stance that the RTGs can successfully withstand almost any catastrophe, and, in fact, back it up with video footage from their field tests. NASA claims to have done extensive probability testing on the possible release of radiation during the launch as well as when Cassini returns near the Earth in 1999 in a final “catapult” maneuver that will help hurl it out towards Saturn. They place the odds of plutonium release at launch are as little as 1 in 1,400 and the slingshot maneuver at only 1 in a million. Even so, if plutonium is released, it is not expected to cause a worldwide epidemic of cancer. Only a few hundred people, at most, would be at risk. (13). Opponents to the Cassini launch believe the damage resulting from any accident will be far worse than NASA expects. Dr. Michio Kaku, a physics professor at the City University of New York, had put many hours into a lengthy counter-argument to NASA’s probability calculations. Dr. Kaku believed that if the launch vehicle exploded during lift-off, much as the Challenger did, it might have released plutonium dust into the wind. In this case, the accident would have had the potential to irradiate millions of people — a fact which NASA fails to even consider in their calculations. Dr. Kaku does not end his criticism without offering some constructive alternatives to think about. He encourages NASA to consider using heavier, admittedly cumbersome solar panels instead of plutonium and remove instrumentation to make room for the increase in weight. Or, instead of using only solar or nuclear power, NASA should consider using fuel in conjunction with the solar panels. Finally, Dr. Kaku stated that Saturn will be around for a long time to come, and NASA will have plenty of opportunities in the future to mount safer, less expensive missions. Exploration is a part of human nature. The world would not be the same if it wasn’t for people like Marco Polo, Christopher Columbus, and Lewis and Clark. It stands to reason that we’re not going to stop our exploration of our solar system any time soon. Perhaps there is something out there that is easily worth the time, money and risk involved; another life form, a cure for cancer, or a world suitable for terraforming to relieve population pressures. Fantastic ideas, perhaps, but not inconceivable. It is also a part of human nature to make mistakes. Accidents happen, and there is no doubt that the space program will continue to have its share of problems. In the future we can expect NASA to have a number of setbacks and heartbreaks, but we can also help to minimize them. Instead of putting thousands of man hours into trying to prevent NASA from launching its missions, we should be contributing to their research involving ways to make the missions safe. With help from educated people like Dr. Kaku, as well as volunteer time and money from the activists, we could easily come up with either a viable alternative to nuclear-powered space vehicles, or a container so strong and well tested that it would convince the most skeptic critic of its safety. The final word is that Cassini launched on October 6th without incident. In this case, at least, the critics were wrong — NASA was able to correctly gauge the risks against the benefits, and, if everything goes well in the 1999 Earth fly-by, we’ll be reviewing valuable, never-before-seen footage from our ringed, 7th planet in June, 2006. Broad, William J. “Powered by Plutonium, Saturn Mission Provokes Warnings of Danger.” The New York Times. 8 Sept. 1997: A4-5. Hewitt, Don. (Producer). “5-4-3-2-1 Liftoff!” Transcript of 60 Minutes. 5 Oct. 1997. Kaku, Michio. “Accident Risks from the Cassini Space Mission.” http://www.fcpj.cassini.com/nasa/kaku.htm. 20 Nov. 1997. Mahal, Davinder S. “The Space Shuttle Challenger Accident, 1986.” Research Paper for Logan Multimedia. 1986. Merzer, Martin & Long, Phil. “NASA to launch plutonium-filled rocket — Critics fear a mishap would affect millions.” Knight-Ridder Newspapers. 25 Aug. 1997.